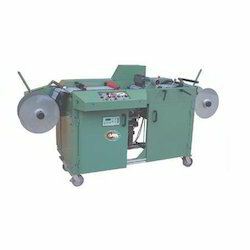 Wholesale Supplier of a wide range of products which include ultrasonic label slitting machine. For the parallel cutting of rolls to final label widths and with fine edges LT-200 incorporates the latest technologies to give the best results. Its design makes it easy to adjust and increase production. Using the Ultrasonic technology it has the advantage of high speed, high efficiency, easy to operate, high accuracy, proper alignment, and smooth slit edges. Looking for Ultrasonic Label Slitting Machine ?